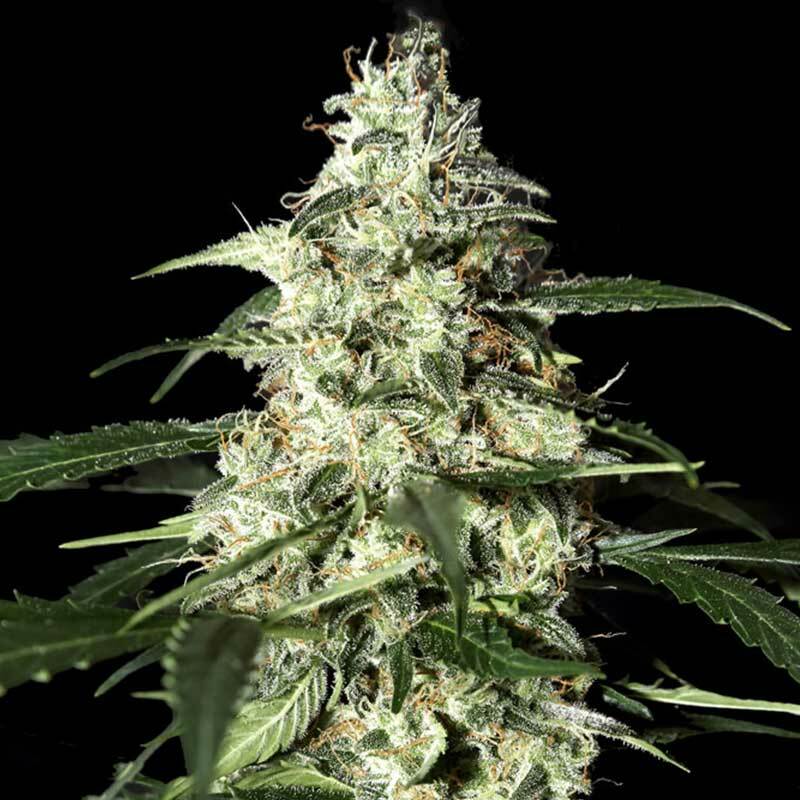 Skunk Auto cannabis seeds are easy to grow for novice growers and provide a good harvest with a fragrant old school taste. Strain Hunters seed bank wanted to recreate this classic strain, which was a cross of Skunk and a ruderalis variety. Skunk Auto is a stabilised and vigorous hybrid that will produce top quality buds. You can easily harvest between 80 and a 100 grams per plant, with a low turn around time of 9 weeks total crop time. Skunk Auto is 30% Sativa, 60% Indica and 10% Ruderalis. The plant is a short flowering plant also in the sense that it only needs between 90 – 120cm growing space height. So it can be grown in places either indoor or on balconies without the fear of having male plants. Because of being an autoflower the Skunk Auto cannabis seeds can be grown during any photoperiod. Using a 1000 Watt HPS you can expect up to 0.8 grams per watt of dry and manicured buds during the 7 weeks of flowering. The vegetative state of growth will automatically switch to flowering after weeks of growth. The Skunk Auto stretches rapidly in the first few weeks of growth, resulting in medium internodes with lots of branching and a lush foliage. The leaves are dark green and overlapped, and generally fast growth from seed to harvest within nine weeks. Skunk Auto is a robust and hardy plant that can withstand hot temperatures of up to 30 degrees Celsius. The flowering buds form slowly during the first few weeks but develop rapidly in the last few weeks of the 7 week period. The buds once cured are light green with hints of yellowing. They smell like caramelized flower blossoms with complex aromas of earthy, rose, and lilac. Skunk Auto cannabis is definitely a fast hitter with both a body and cerebral high making you stoned for hours. Very similar to the psychoactive effect of the original skunk the Auto Skunk by Strain Hunters. AROMA (Unburned): a very complex blend of earthy-mossy aromas, mixed with summer flowers and blossoms. Reminds of rose and lilac. EFFECTS Speed of high onset: fast hitter. Duration of high: long lasting. Quality/type of high: strong, long lasting, cerebral and body-like. FLAVOUR (Burned): skunky flavour with notes of summer flowers and blossoms, it has a very characteristic taste. FLOWERING TIME Flowering Indoor: 7 weeks flowering time with a yield up to 0.8 gram (dry and manicured) per watt per m2 (with 1000W HPS). 9 weeks total crop time. Can be flowered at any photo period between 12 and 18 hours of light per day.Flowering Outdoor: 7 weeks flowering time with a production up to 80-100 grams/plant. Very vigorous plant, long branching. MEDICAL Not yet evaluated, testing is in progress. Taking the Skunk family back to its Afghani roots, Super Skunk adds flavour, weight and potency to t..